﻿My DH's birthday is on October 14th, so this card is for him. Thought I add a calendar to the card so he'll remember the date. LOL. This is an inside joke that he will understand. 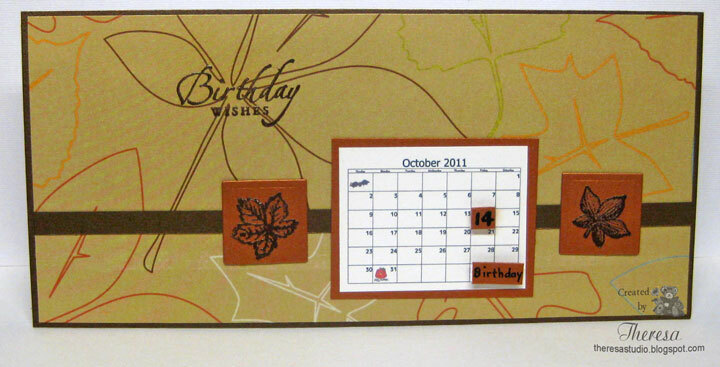 I used a copy of a calendar that I had made and reduced the size to fit the card. Added some fall leaves stamped with some old Hero Arts stamps on Copper CS squares...embossed with Zing Chestnut EP. I used a base of Bronze Metallic CS with a mat of a pattern paper that I have been saving for years....just too pretty to cut, but thought the metallic look and design of leaves was perfect for this card. Added a mat of Copper CS to the calendar and highlighted the date with the same CS. 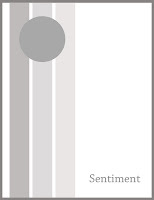 Sentiment is an old SU Birthday stamp also embossed in Chestnut. Like this card for an Autumn Birthday. Our Creative Corner: Include number or numbers on your project. Mark's Finest Papers' challenge this week is use things with wings. 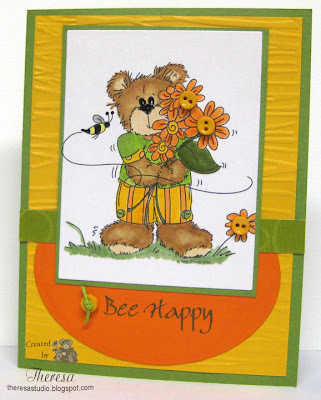 After searching my MFP's stamps I decided to use bees and sentiment from "Happy Pansies" and use the Sketch challenge from Card Patterns. I stamped the bees on yellow cs and cut out with Nesties circles. Added some highlights with Sakura Clear Star, Black Glaze, and Yellow Glaze pens. I used a green textured cs and a white mat cs embossed with Cuttlebug EF Leafy Branch and highlighted with Memento Pear Tart ink. Used a border on the side punched from yellow CS with Martha Stewart Scallop Dot punch. Sentiment stamped in Memento Tuxedo black same as the bees. Unknown Papers were from a garage sale find. Since I was lucky enough to have won at Phindy's Challenge last week, I just had to enter again this week. I am doing more and more with digis that are so easy to print off and adjust the size to fit a sketch. I used the image "Bear Hug" (another very favorite) that I colored with Red and Green Copics and Memento markers. I cut it using a Nesties Oval die to use in a Sketch from Tuesday Morning which I rotated for my design. I used Pattern Papers from BasicGrey Figgy Pudding scraps leftovers from last year. Stamped a GKD sentiment with Versamark and Gold EP on Red CS. The sheer green bow that I added hides the verse in the photo. It reads "May the spirit of Christmas fill your heart with warmth." I thought this was fitting for the image that I used....hugging your bear fills your heart with warmth. Phindy's Place Challenge: Use opposite colors from the color wheel. My choice was to use red and green. Listen to "That Old Black Magic" by Sinatra here. experimenting. 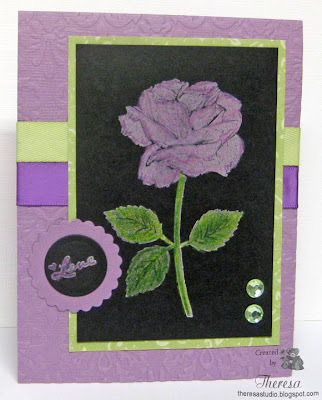 I stamped GKD's Rose from "Pressed Flowers" set by Melanie with Brilliance white ink pad on GKD Black CS. After drying, I colored the image with Koh-I-Noor pencils. I matted the image on a scrap of SU Pattern Paper and used Bazzill Lavendar CS as the base which I embossed with Cuttlebug EF Kassie's Brocade. I added some ribbons and green gems from my stash. To finish, I added a sentiment "Love" using a old PSX stamp on a circle of black matted with a scalloped circle of the lavendar. 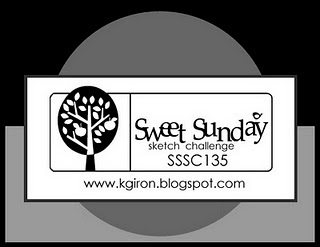 This design was made using a sketch from Sweet Sunday Challenge. 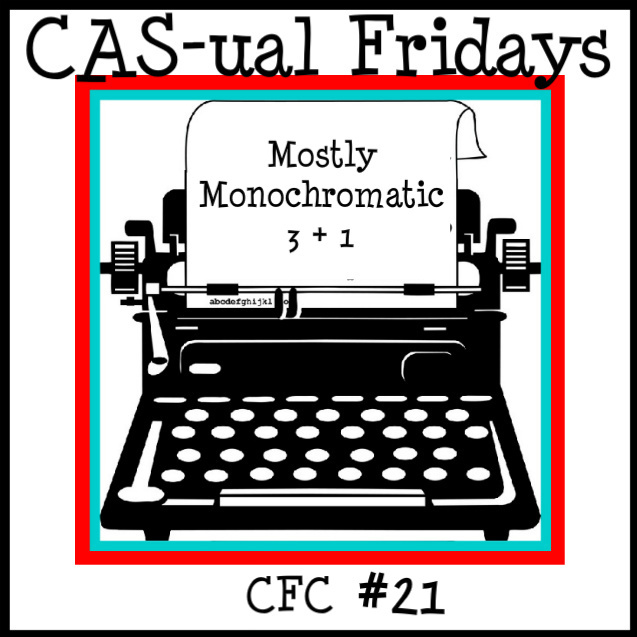 Fussy and Fancy Friday: Try a new technique. Black magic was used. Sentimental Sundays: Step out of your comfort zone. Used a new technique. I used Mo Manning digi Image "Sprout" for this card. Am rushing to get for the challenge before it closes. I used Copics to color and placed the image on a mat of Copper CS and then on a striped mat with ribbon and a copper punched border. Finished with a sentiment and Dragonfly on a base card of golden yellow CS. Used a sketch from Papertake for the design. 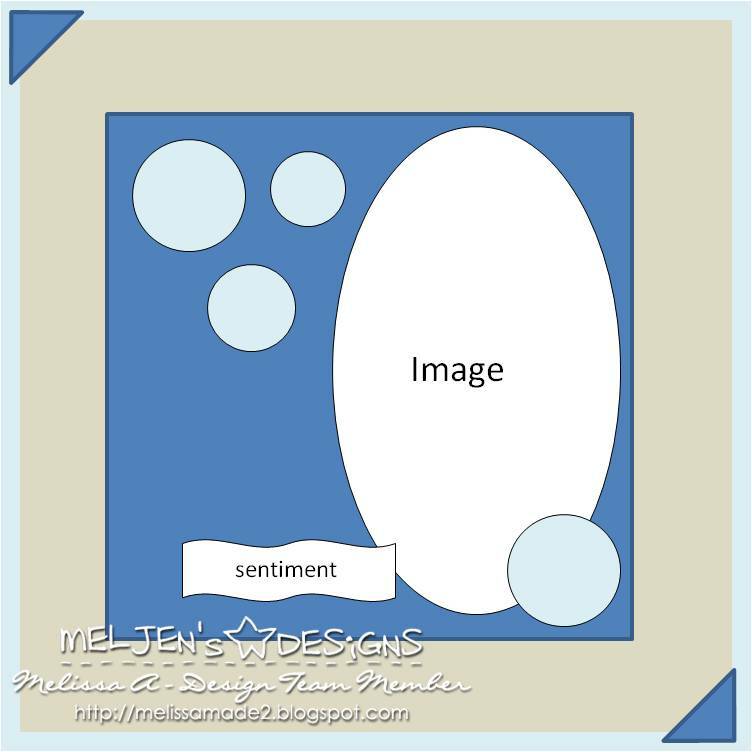 I made this card for Meljens Designs Blog challenge and for Paperplay who's sponsor this week is Meljens. I used 3 digital images from Meljens including Teddy Pilgrims and 2 sentiments Happy Fall and the Fall badge without the outer circle. I colored in fall colors Copics, added some pencil highlights and sponged the edges. I used an orange CS for the base and a mat of Pattern Paper of leaves. Attached the cut out images to a mat of the orange CS and added some cutout leaves from the PP. It appears that the leaves are falling from the paper onto the card. Finished with some corner photo tabs. Also embossed the mat under the images and highlighted with ink. 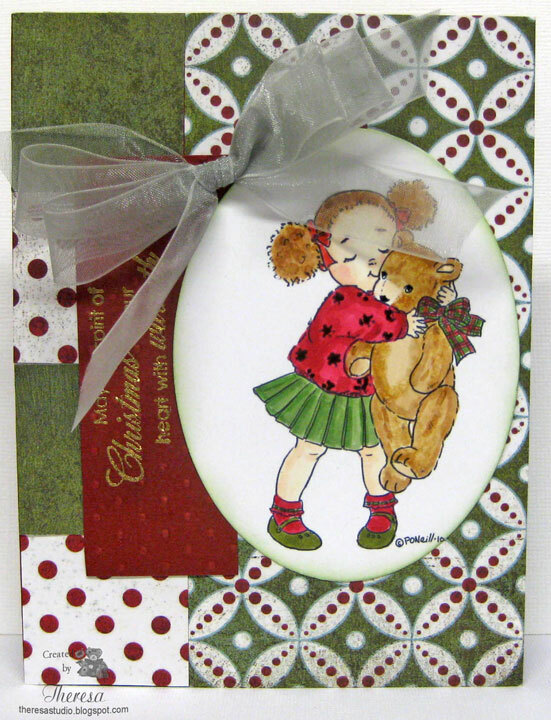 The challenge at Sugar Creek Hollow is to make a vintage, shabby chic or primitive card featuring Vintage Children. 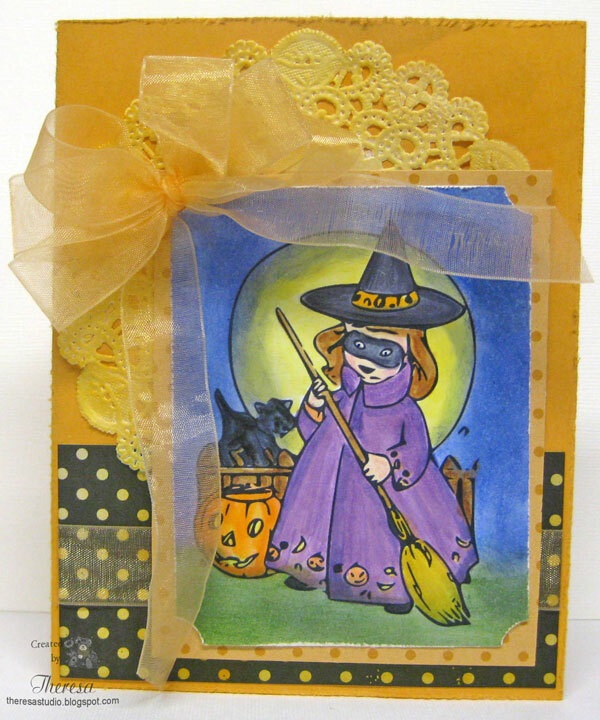 I downloaded this digi image "Vintage Lil Witch" from Paulette at Create with TLC sometime ago. I think this is a perfect image to use. I colored it with copics and sponged the background and cut out with a die. This was placed on an orange dotted mat. For the base, I sponged an orange CS with distress inks to soften the color and distressed the edges. 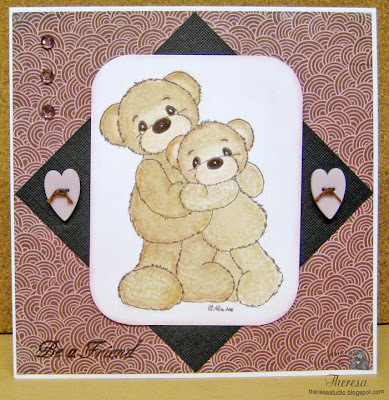 I used another dotted DP and a doily for the background to which I also added distress ink. After assembling the card, I added some sheer ribbon. I am not sure if this vintage or maybe shabby chic? Scrap Creations: It's a Girl Thing. 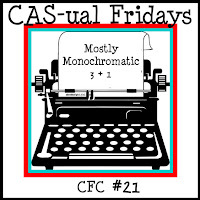 At CAS-ual Fridays, the challenge is to create a Clean And Simple project using at least 3 shades of a monochromatic color (your choice) PLUS Brown. 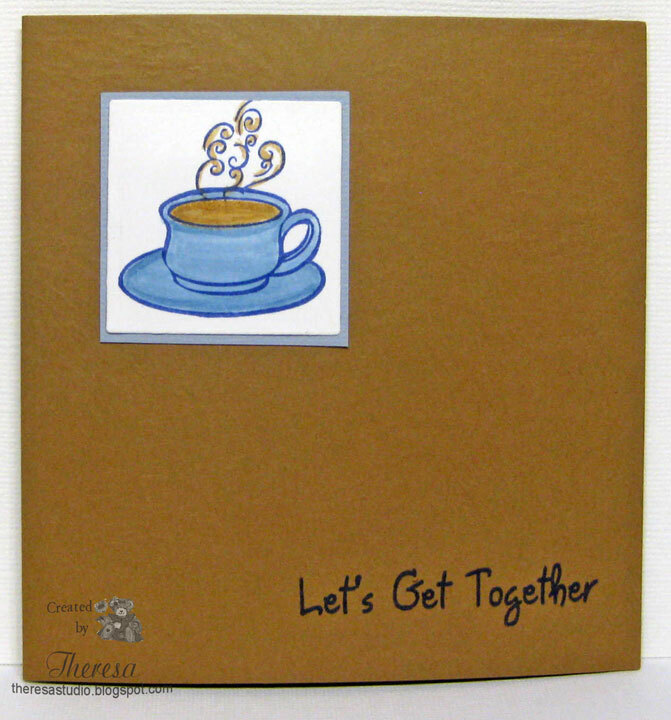 I am combining this challenge with the sketch challenge at Less is More and a theme challenge at Stamptacular Sunday with a theme of "Have a Little Latte". 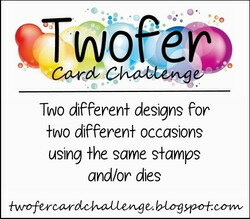 I find it interesting and challenging to combine several challenges into one card. I used a GKD stamp that I stamped in Memento Paris Dusk ink on white CS and colored with Copics using B93 for the blue. I cut with a Nesties Square die and matted on a scrap of Bazzill Blue CS which gave me 3 shades of blue. I attached this to a GKD Leather CS and Stamped the sentiment from Creative Vision "Hello Hunny" set in Paris Dusk. Stamptacular Sunday: Have a little Latte. Have a cup of coffee. Thanks for stopping by! I am beginning to enjoy clean and simple cards more and more. And this style always makes a good card for a male. I made this one 4" by 4" with White CS as my one layer using an Annabelle Stamp "All Things Grow". I stamped with Memento Rich Cocoa ink for the image and sentiments.....brown is always a good choice for a manly card, don't you think? Added some dew drops and manly brown ribbon to finish. Also did a row of embossing with Cuttlebug EF "With Love" to add texture. 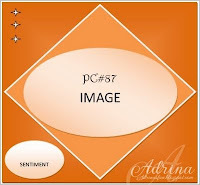 AnnaBelle Stamps Blog: Say it with...a male card. Allsorts Challenge: Clean and Simple style. Truly Scrumptious: Clean and Simple. Welcome...fall is here....bee happy! 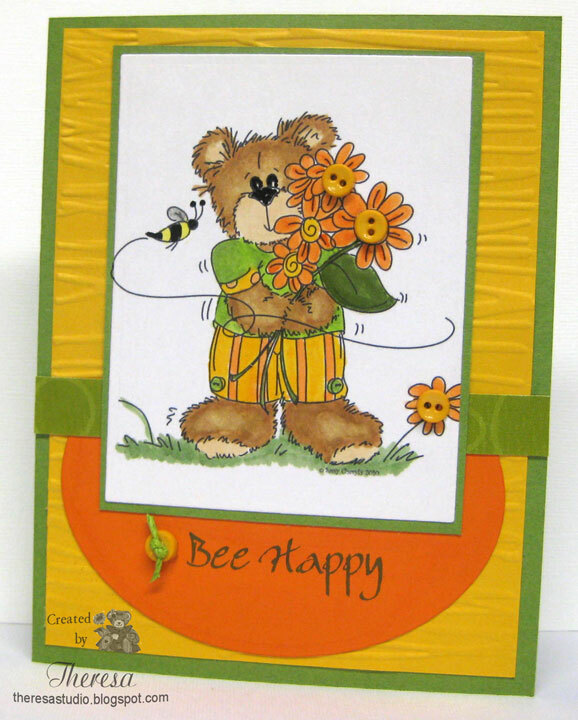 This litlle bear has picked some fall flowers ...he is a Sassy Cheryl digi and is one of my faves. I colored him in these fall colors with Copics and placed him on this card that I designed with a sketch from Thursday Cute Card. The sentiment is from MFP's "Happy Pansies". Finished with a lot of buttons. Sassy Cheryl's Challenge: Flower Power is theme. Tuesday Throwdown: Theme is fall. 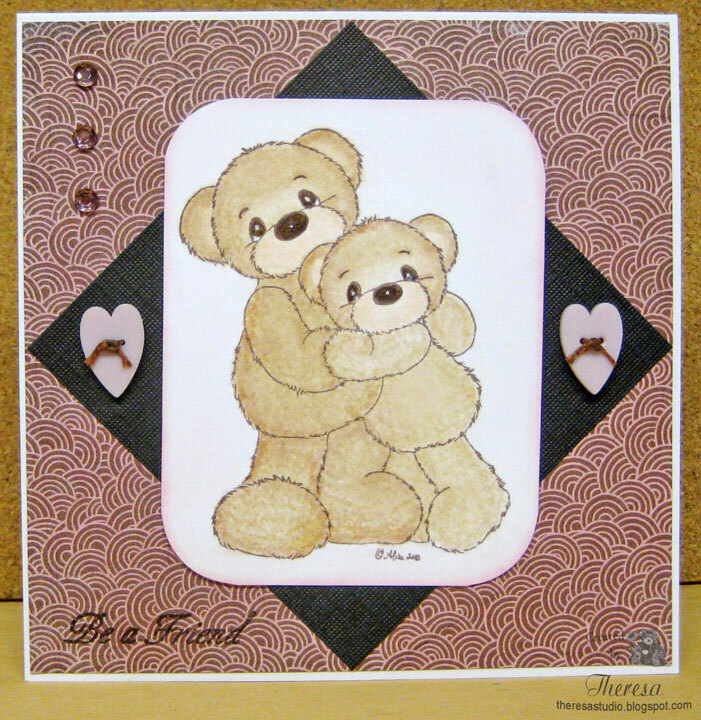 Bearly-Mine Challenges: Button It Up-4 buttons on my card. 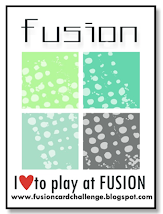 The Play Date Cafe: Color challenge is shown below. Cute Card Thursday: Sketch below. Paper Cutz Challenge: Button up for fall. 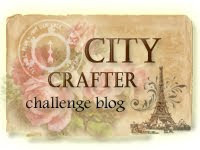 Crafty Catz Challenge: Theme is Autumn. Kaboodle Doodle: Lots of layers. I missed the sketch challenge deadline for the sketch that I used but showing it below anyway. 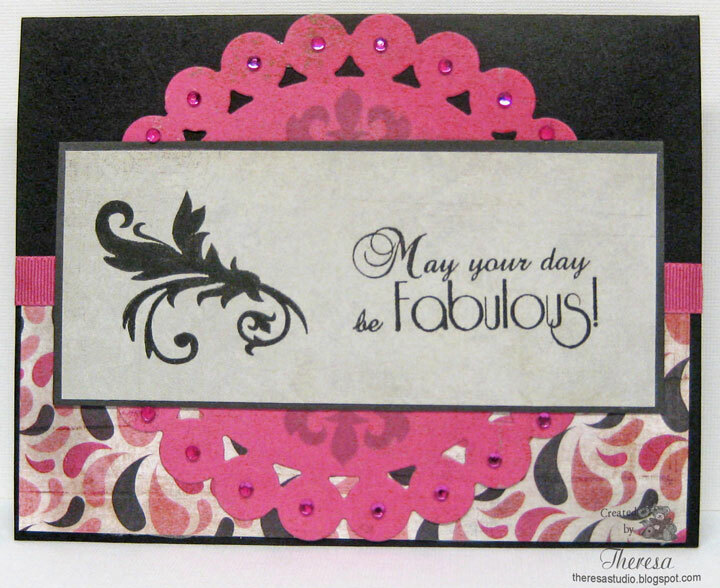 This card began with a Black CS base that I embossed with Cuttlebug EF Divine Swirls. I added some pattern paper in purple with flying ghosts from my scraps . 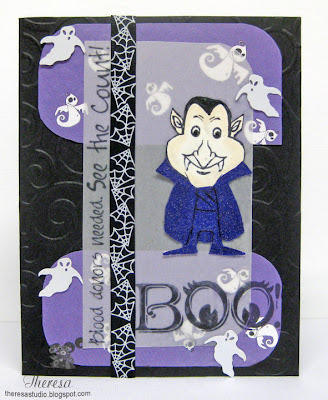 Then added vellum paper strip stamped with sentiments from MFP's " Boo To You " stamp set using Memento Tuxedo Black. Topped this with a ribbon. Stamped the Dracula from the same stamp set on white CS with the same black ink and paper pieced with a scrap of Glittery Purple Paper and cut out the image and colored his face with copics and white gel pen. Attached him to the top of the card. Finished with more ghosts that were confetti from my stash. Cupcake Craft Challenge: Use Black and Purple for the theme Darkside. 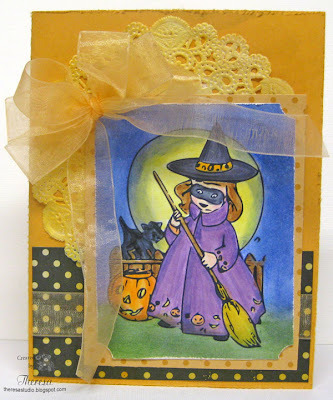 Tuesday Throwdown: Theme is fall....did a Halloween card....that is fall favorite holiday, isn't it? Crazy 4 Challenges: Make a Halloween Card. 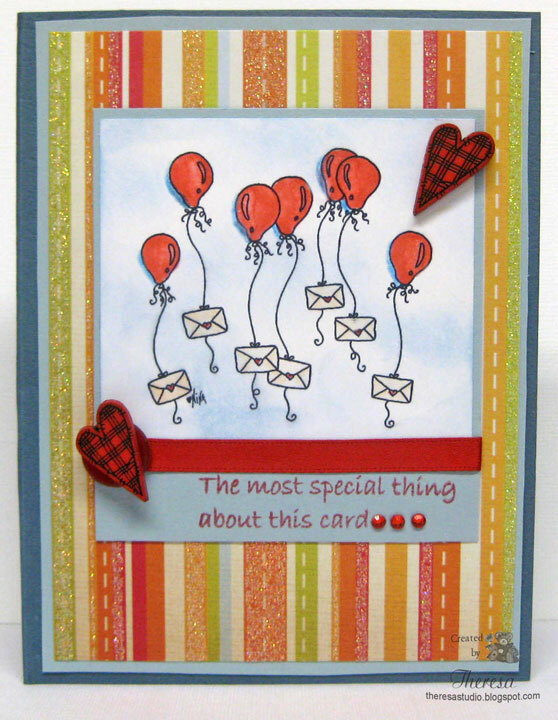 The challenge at There's Magic in the Air is to make a special card for someone special. I used a Paper Cupcakes' image "Sending Love Your Way" that I downloaded free a few weeks ago. Thanks , Nina. I have made this with some special sentiments from Little Claire Designs sentiments from her "Dog Window" stamp set that I won. Also used some Honeycomb Paper from Inky Antics on the inside that I bought this spring...just been waiting to use in a special card. I colored the image with Copics and matted on blue cs and a mat of striped paper from We R Memory Keepers Scrapbook paper and a solid blue cs mat. Placed this on a blue card base from stash using a sketch from The Sweet Stop. I finished the outside of the card with ribbon, buttons, some red rhinestone bling, and a sentiment that reads "The most special thing about this card....." (continued on the inside). The inside was finished with a balloon that I cut freehand from the Honey Comb Paper and a string of twine. The sentiment "... is the person holding it." ...was stamped with Memento Rhubarb Stalk ink the same as the sentiment on the front. 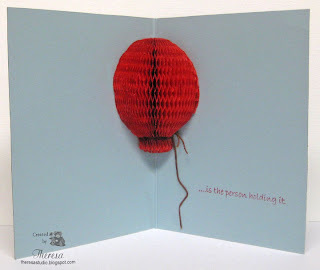 This was a fun card to design for a special person. There's Magic in the Air: Make a card for someone special. Paper Cutz Challenge 110: "Button Up for Fall"! Make a card, LO or craft project for Fall using LOTS of buttons and any colors you’d like! May not really be a fall card but will be special for any season. But I am using some fall colors in the background. Used 3 buttons-2 are layered on the left. 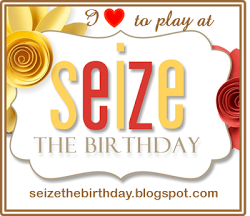 This special card is for all you special people that visit my blog. 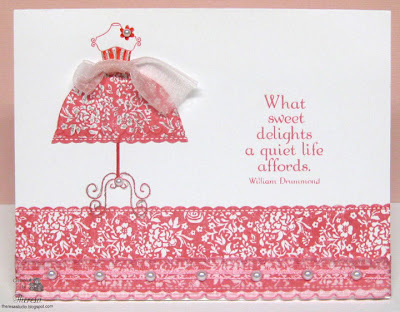 I am not one to do "Girly "cards but Timeless Tuesday's challenge is “All Dolled Up” and I love their challenges. Betty is asking us to dress up and go all girly with ribbons and bows, pearls and glitz, and anything else girly. This was a stretch for me....I always like to use Flourishes stamps for their challenges but I mostly have their Floral stamps which did not inspire me for a girly theme. But I found a border from "Stars and Stripes" set to create this card. I combined it with a GKD Stamp"Celebrate in Style". This turned out to be a one layer card but I did not really plan that. I stamped the border in SU Regal Rose ink (a girly color for sure) across the bottom edge of GKD PL white CS and layered it with a sheer ribbon that has scalloped edges. I stamped the dressmaker form directly on the card using the same ink. I paper pieced the skirt with paper that I stamped with the border stamp so it matched the edge of the card. I colored the bodice and flower with Sakura Glaze and Clear Star pens. Added glitter to the skirt and legs of the form using the Clear Star pen. Used light pink organza ribbon for a sash. Stamped the sentiment from Flourishes "Lenten Rose"....what girl does not enjoy "Sweet Delights"? AnnaBelle Pearls were finally added to finish.....a girl must have her pearls! Timeless Tuesday #136: All dolled up. Sentimental Sunday: Monochromatic plus sentiment. 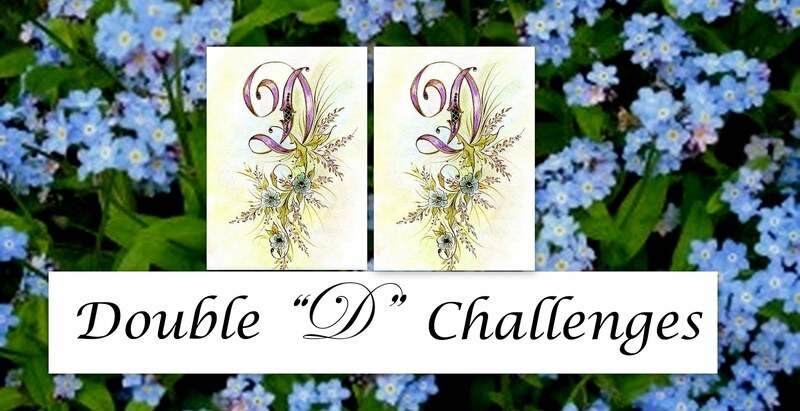 Alphabet Challenge: Q for quick and simple. 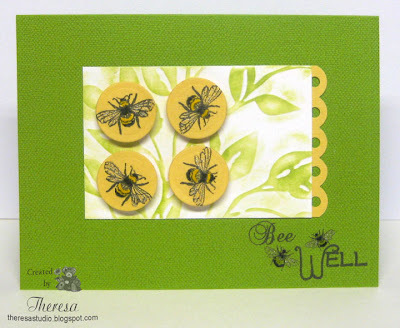 One layer cards are quick and simple. Lily Pad: Simon Says Stamps' Bling Challenge-used lots of pearls. Allsorts Challenge: Keep it clean and simple. 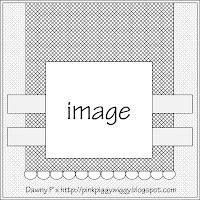 Designer’s Choice Challenge: DCC914 One layer CAS card. Stamp, Scrap, and Doodle Saturdays: Do a card with your fave color or colors. Lately pink has been one of my fave colors to card with, and I even have some pink shoes. Hope that you are enjoying some sweet delights tooday. Rainy, gloomy day here in Ohio....so that means a good day to play in the studio. 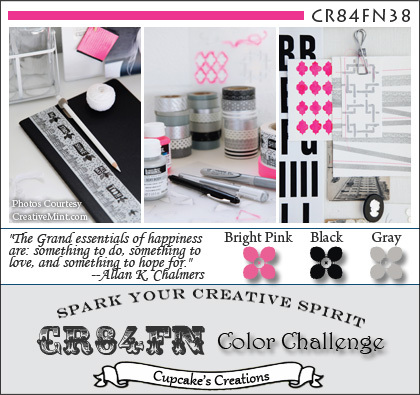 I decided to make this card for two Challenges shown below....a color challenge of Bright Pink, Black, and Gray combined with a Sketch Challenge. I started with a base of Black CS, added a panel of Designer Paper, some ribbon, a Pink circle with rhinestones and stamped Flourishes, and finished with a Grey Pattern Paper stamped with a Flourish and Sentiment in black and matted in Dark Grey CS. This card is a bit more dramatic than I usually make. Simon Says: Uses dies and or punches. 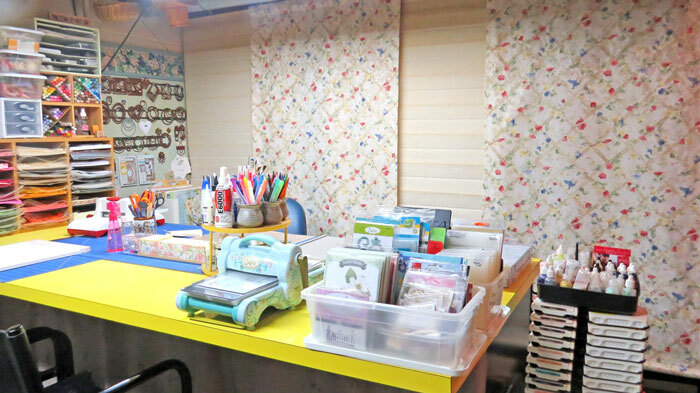 Sugar Creek Hollow's challenge is to create a vintage, shabby chic or primitive card or project featuring FANCY BORDERS. 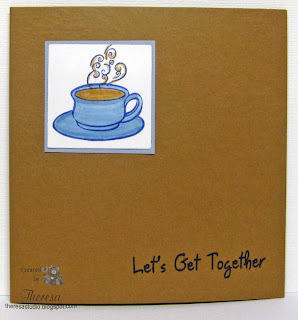 I am entering this card made with Martha Stewart double loop around the page punches. 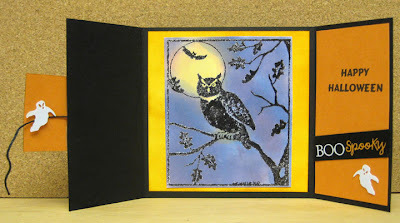 I made this card at my Stamping Club meeting and it was designed by my friend Rita. 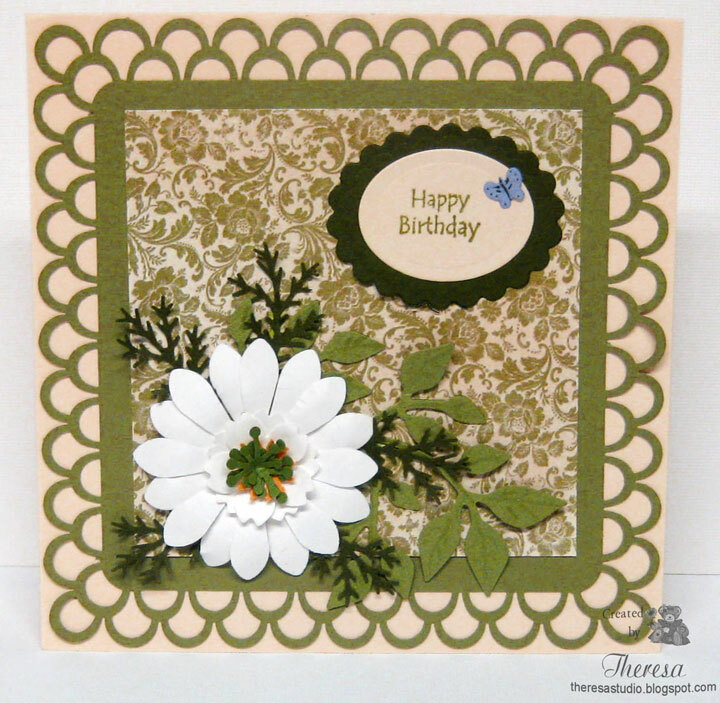 We used ivory and green card stocks and pattern paper from Graphics 45 which has a lovely vintage look. Flower, leaves, and branches was made with various punches and shaped with tools to create 3D look. Finished with sentiment stamped in Memento Bamboo Leaves on a die cut oval with a scalloped oval mat and a punched butterfly. Stamp, Create, and Doodle Saturday: Theme is Birthdays. Simon Says: Use dies and or punches. A lot of dies and punches used in this card. of red.﻿ I used a sketch from Card Patterns shown below. Using a base of red, I added mats of Pattern Papers from BasicGrey Figgy Pudding and did a scalloped edge using Fiskars punch. Finished with a sentiment of an unknown source stamped with Memento Rich Cocoa and cut with small scalloped oval die. Added some green rhinestones for a bit of bling. 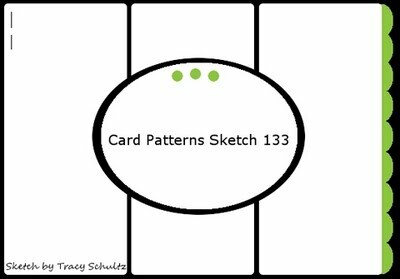 Card Patterns: Sketch #133 below. Critter Sketch: Recipe challenge-Use 1 image, 2 different pattern papers, 3 embellishments, and 1 sentiment. Card happens to follow recipe. Papertake Weekly Challenge: Creature comforts. Think my little raccoon and bunny count for the challenge? 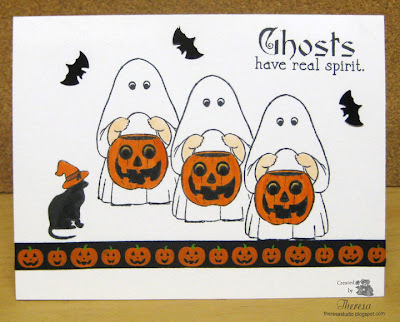 Halloween cards are such fun to make especially with a great stamp set like "Boo To You" that I bought from Mark's Finest Papers this week. Just had to have this one after seeing the release last week. I had to take time and make this One Layer Card for their challenge this week....so quick and so much FUN! I stamped 3 Ghosts with Memento Tuxedo Black using a mask to stamp in a row. Also stamped their friend "Speedy" on the card. Colored in pumpkins and hat with Memento Markers Tangelo and Potter's Clay. Added the Sentiment, Pumpkin Ribbon and Confetti Bats from my Halloween stash for a spooky finish. 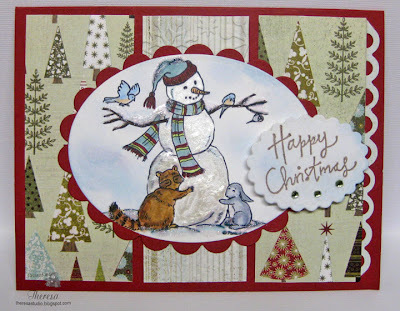 Speedy the Cat's Friends Challenge: Make a one layer card. Crazy 4 Challenges: Use a pumpkin on your project. The Paper Players Challenge: Use a Animal or Plant on your card. Hope Speedy the Cat qualifies my card. One of the most difficult cards for me to make is a monochromatic card...I don't know why, but it is. When I saw this sketch at Lily Pads, it inspired me to make a monochromatic card maybe because it was designed in monochrome gray. Any who, I dug out some Bazzill textured CS in green tones and combined with a Stampin Up pattern paper to create this project. Used a Leaf Stamp and Sentiment from GKD's "A Year of Leaves" that I stamped with Memento Bamboo Leaves to keep everything green. This a very simple design but pleased with the monochrome color combo. Lily Pad Sketch Challenge: See sketch below. Fairly simple compared to most of the entries. Sentimental Sunday: Monochromatic plus a Sentiment. Truly Scrumptious Challenge: Clean and Simple. Fab 'n' Funky Challenges: Hard to make theme. As I said above, monochromatic is hard for me. Our green leaves are beginning to show some fall colors. 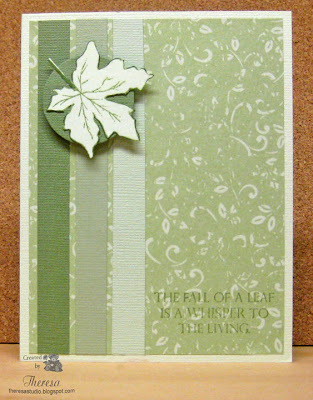 This would me an easy card and layout to make in fall colors as well. Here I am back for a second post and I am rushing to get this in for a couple of challenges closing very soon, but oops, missed one. I am using Mo's Digi "Young Love" for her 100th challenge ﻿Let's celebrate. Just had to get a card in for this special challenge. To be short, I colored the image with Copics and made a frame of Silver and Blue CS using a sketch from Tuesday Morning Sketches. Added some pattern paper as background and finished with brads with stones and rhinestones. Used a sentiment to make this an anniversary card. ( The challenge that I was too late for was one to use silver). Mo's Challenge: Let's Celebrate. Congrats to her on her 100th challenge. Tuesday Morning Sketches: See sketch below. Digital stamp: Mo's "Young Love". Stamp: MFP's Sentiment from "Happy Pansies"
Joan's Garden Challenges have returned but I missed her first one. 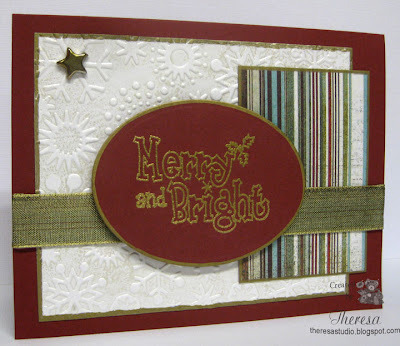 This week her second challenge is to create a Christmas Card, create an embossed background using Selma's Technique, use striped designer paper, and gold emboss your sentiment. 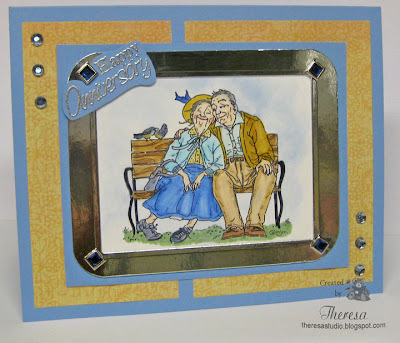 Selma's technique is to use an embossing folder and ink the folder before embossing your paper. It has been awhile since I used this technique but I like the results. I used Brilliance Platinum Planet ink with the Cuttlebug EF Snowflakes. I tried several inks before I decided on this one. It gives a very subtle almost shiny effect. Click on photo to see better. I combined a sketch from The Sweet Stop to create my card. Using a cranberry card base, I added the embossed background, a striped Pattern Paper, Gold Organza ribbon over a strip of the striped paper, and finished with the Gold Embossed sentiment on an oval of the cranberry CS. I added the gold star brad for a starstruck element. Joan's Garden Challenge #2: Details listed above. The Sweet Stop: Sketch with a spin of starstruck. See below. Stamptacular Sunday: Just Saying-create a card with some sort of sentiment/words on the front! CRAFTS AND ME Challenge: Use some stripes. Stamps: Creative Vision "Let it Snow"
I have yet another Bear Stamp.....this one is from The Pixie Cottage and is called "You Give The Best Hugs". I used it in a card for The Pixie Cottage challenge which is a sketch with the theme option of "Fussy and Fancy" to add embellishments, ribbons, lace, embossing, anything you like, just make it as fussy and fancy as you can! This may not be as fancy as it could be but I did not want to distract from the cute bears. I stamped (with Memento Rich Cocoa)) and colored the bears with Copics and used a scrap of terry cloth and Colorless Blender to give a furry effect. I trimmed the image, rounded the corners and edged with Distress Ink Spun Sugar. I made a square card using White CS as base and attached a mat of Basic Grey PP from Hopscotch paper pack. Added a square of Brown Textured sticker paper from stash and topped with the image. Added some pink heart buttons with twine and some pink rhinestones for bling. 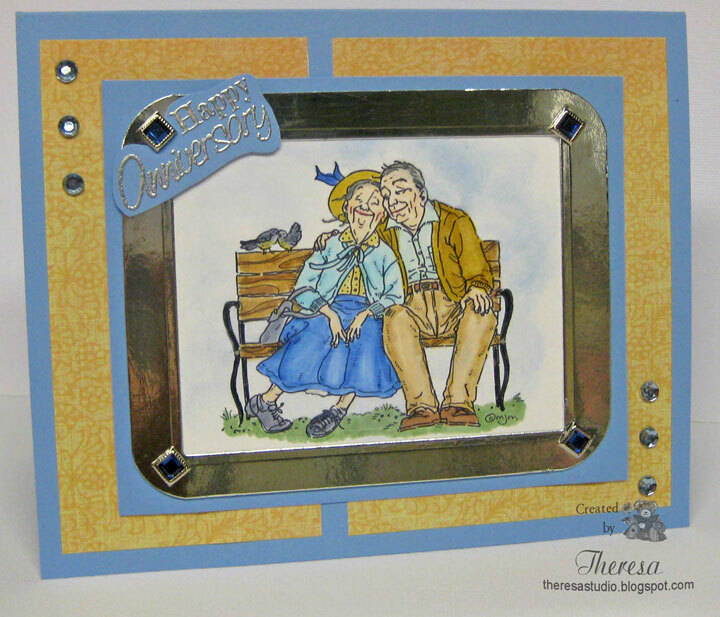 Finished with a sentiment embossed with Zinc Chestnut EP using PSX Pixie Expressions stamp (very old). 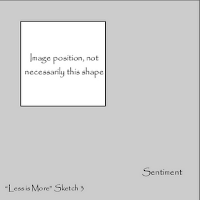 This card was designed using the Sketch below. Bearly-Mine Challenges: Use one or more buttons. BasicGrey Challenge: Use Brown and Pink Color Combo with BasicGrey Product. Used Hopscotch paper. Sending big hugs out to everyone who visits today. This card just evolved as I added elements from several challenges. The starting point was the sketch from Crafty Catz shown below but I flipped the design. Then I stirred in some hearts, pearls, things with wings, paper piercing, scraps and a digital image. 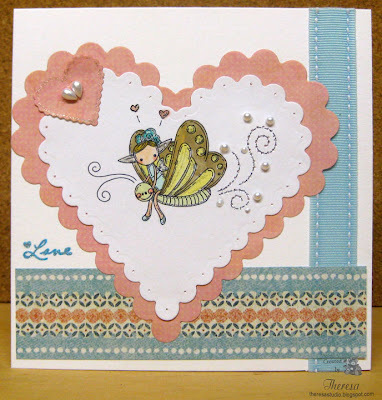 I used this lovely digi from Meljens "Flutterby Fairy" who looks like she is flying around and spreading love in the air. I colored it with Copics and cut it out with a Spellbinder Scalloped Hearts die. I pierced the edge of the heart and placed on a heart cut mat. Using a ribbon and scrap of PP, I assembled the card. Added a small heart with some tear drop pearls ( as a heart) and more pearls on the image. Added some highlights with Sakura Clear Star pen. Lot of heart in this card. Finished with "Love" sentiment. Crafts and Me Challenge: Add a heart. Papertake Weekly Challenge: Things with wings. Tuesday Throwdown: Challenge is pearls. Simon Says: Sing it-use music or film title as inspiration. This card just sang out "Love is in the Air"
Flutter By Wednesday: Open ..used a fairy on a butterfly. 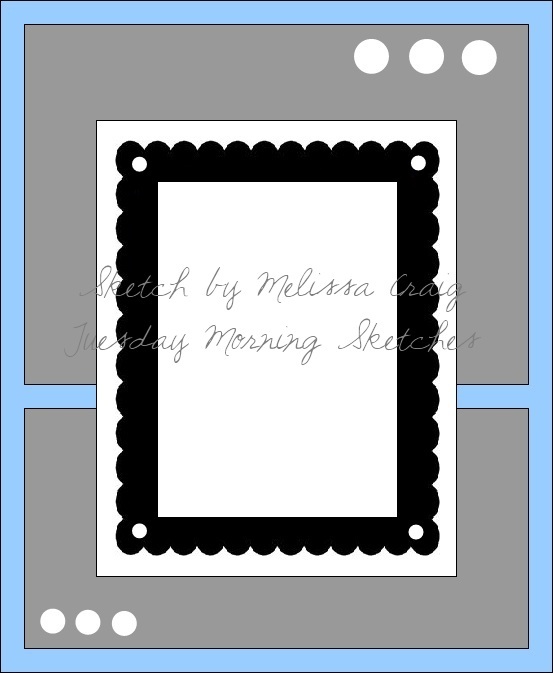 Meljens Designs Challenge: Use Paper Piercing. 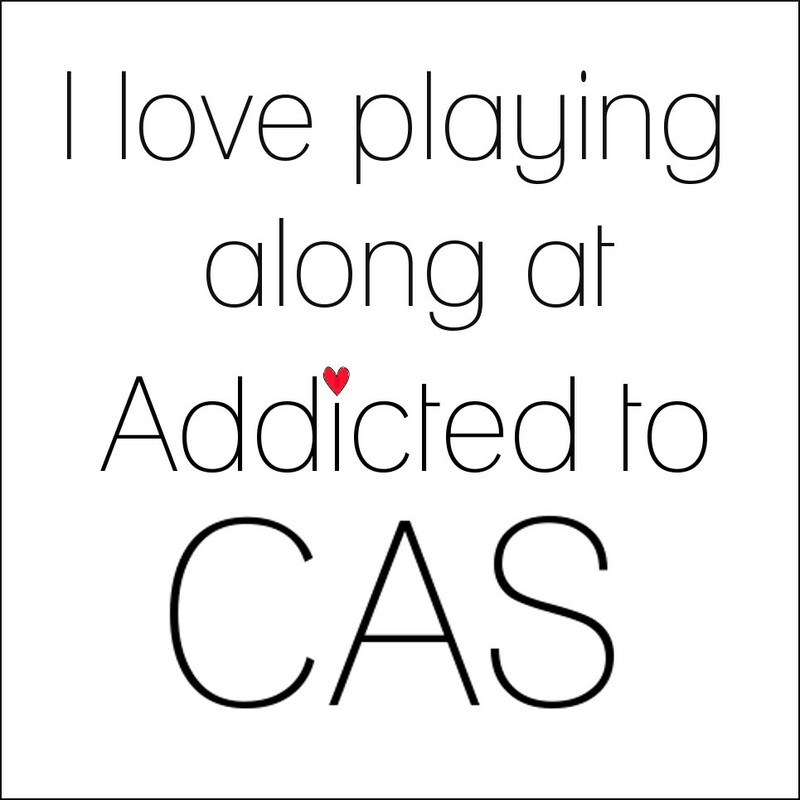 Mine is on the heart and swirl designs. 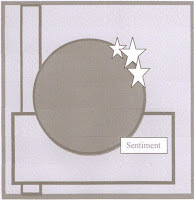 Stamps: Meljens Digi and PSX Sentiment. May there be a lot of love around you today. 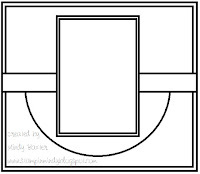 I missed out doing a lot of my favorite challenges last week but will try to get them in this week starting with the Flourishes Timeless Tuesday challenge to make a shape card. 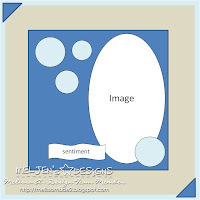 I used Spellbinders Label 1 to create this shape and cut the image with this die too. I used the chrysanthemum stamp from Flourishes "A Year in Flowers" stamped with Memento Tuxedo Black and colored with Copics. Added some distress ink Wild Honey around the edge and attached to the card base of Echo Park Paper. Finished with a green bow with copper leaves. A fairly quick and easy card. 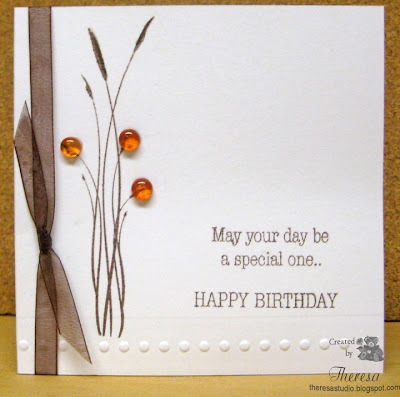 Flourishes Timeless Tuesday: #135 Create a shaped card. 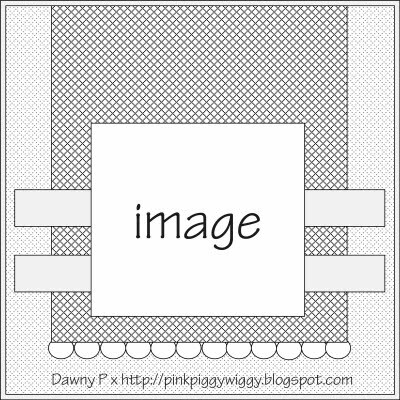 Anything other than the regular 41/4″ x 5 1/2″ card size. 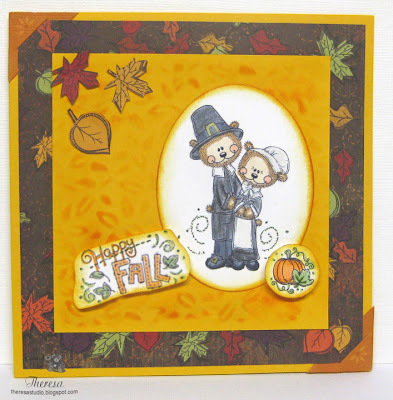 Beary Sweet Challenge: Make a card with a fall or autumn theme. Mums are my favorite fall flower. Mums are blooming in my gardens and I had to buy some more pots this weekend. 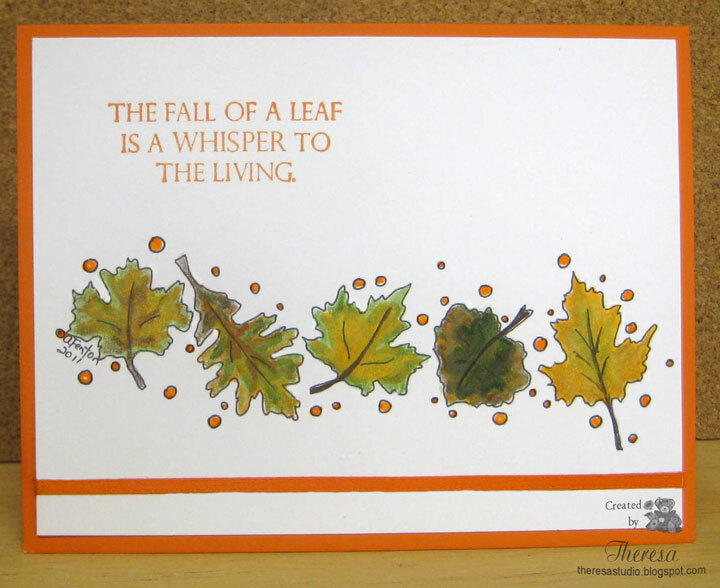 The fall weather that we are having inspires me to make some fall theme cards. When trying to decide what to make for There's Magic in the Air challenge this week, I selected to use this Paper Cupcakes Digi "Elegant Pumpkins". 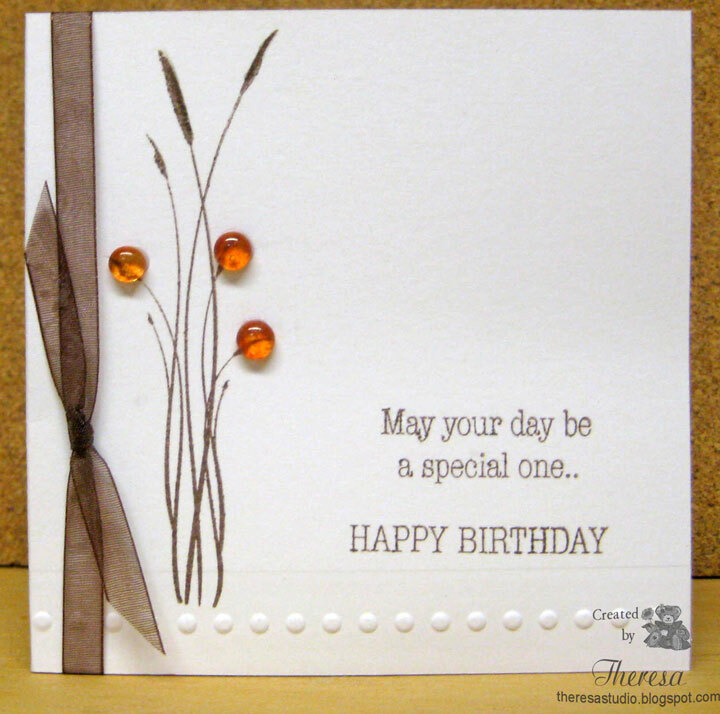 The challenge is to make a shaped card so I used Spellbinders Labels 10 to cut the 3 layers that I used in the card. I colored the image with Copics and sponged some Memento New Sprouts ink on background of the image. Embossed the pattern paper mat with Cuttlebug EF Argyle for some texture. Glossy Accents added to the dish. Used a sentiment from PCC Variety Saying Tickets which I trimmed and added with a green brad. Papers all from stash and scraps. 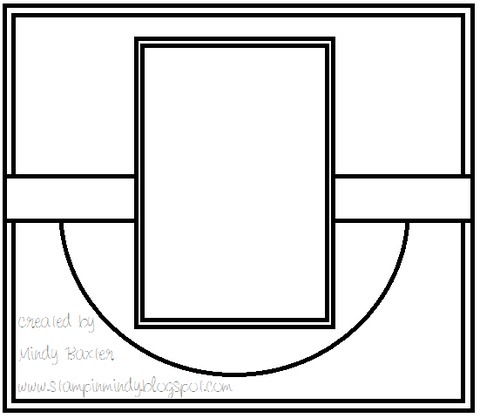 There's Magic in the Air: Jenn's challenge is to make a shaped card. Cards for Men: Anything but square. PaperPlay Challenge: Use Punches and dies. Used Labels 10 Dies and hole punch too. 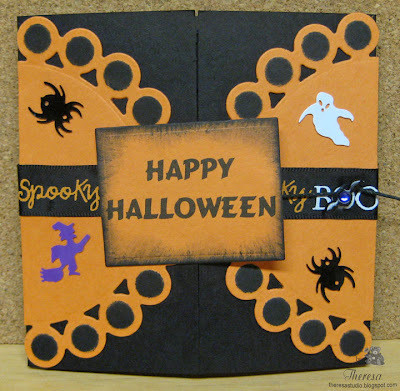 Crazy 4 Challenges: Create a card with a pumpkin on it in some form. What a lovely day here in Ohio today. I love to make Halloween cards and decided to make a gatefold card using this week's sketch from Card Positioning Systems with a Halloween Theme. I cut orange CS with Spellbinders Beaded circle die and sponged with Black ink. This I cut in half and attached to a Black CS base made into a gatefold card. Trimmed the sides with Halloween confetti and ribbon.Added twine for the tie closure wrapped around a bat brad. 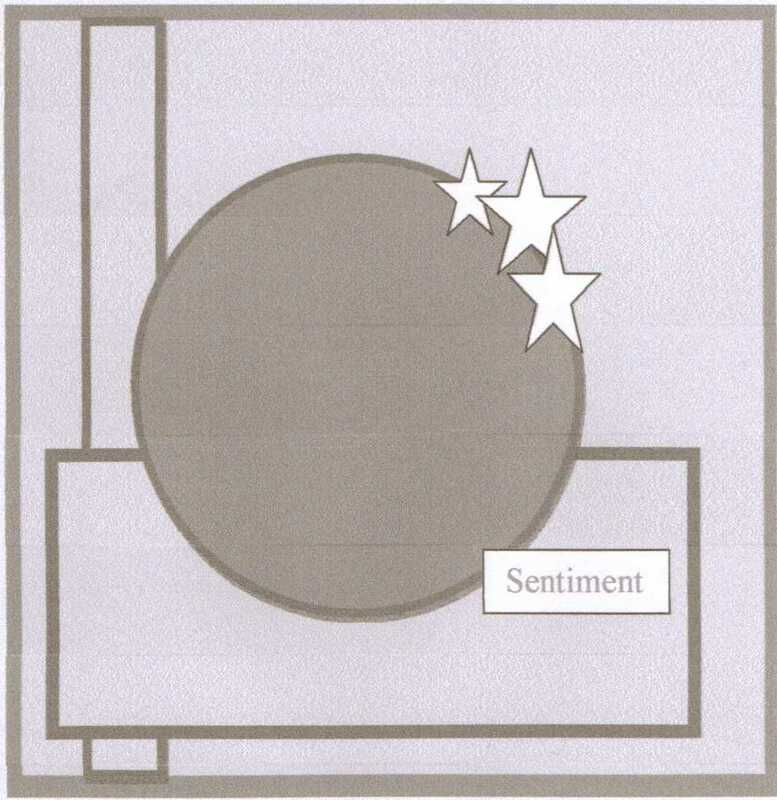 Attached computer sentiment that I sponged with black. Finished the inside with an Owl stamped with Versamark and Black EP. Then sponged on assorted inks to create the night sky with a full moon. 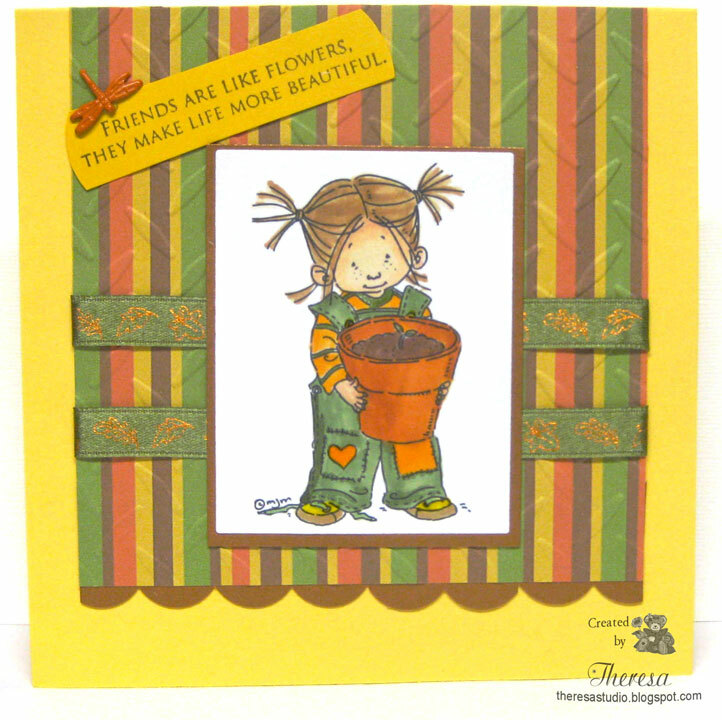 Used a Yellow CS mat under image and finished sides with more orange CS, ribbon, confetti and sentiment. CPS sketch 235: See on right. Scrap Creations: Use Unique Fold. 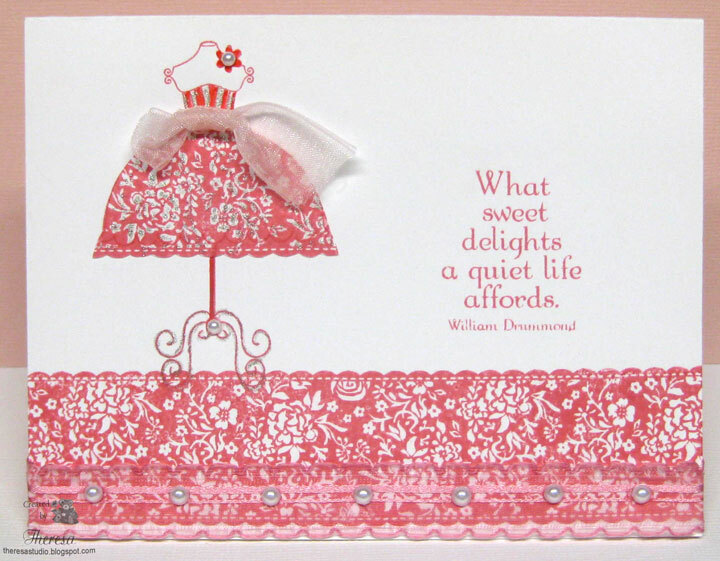 Truly Scrumptious: Decorate the inside of your card. Ribbon, Brad, Confetti all from Stash; Spellbinder Beaded Circle Die. This is a quick post this morning...have been busy doing some house cleaning and chores this week so not much time in my studio. I made this simple card using a digi image from Ann Fenton that I downloaded from The Outlawz. I had planned to use it for a challenge there but that did not happen. I colored the leaves with Copics and Pencils. The sentiment GKD "A Year of Leaves" is stamped with Memento Tangelo. Added the orange ribbon and attached to a card base of Orange CS for a quick fall card to enter in several challenges . 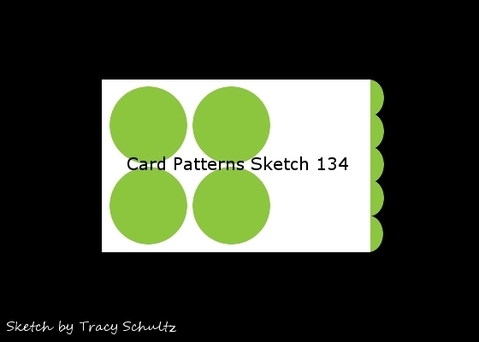 Crazy 4 Challenges: Make your card using the colors orange, olive green, yellow & brown. 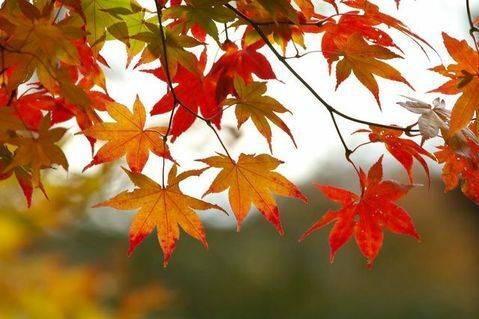 Sentimental Sundays: Theme is Autumn with a Sentiment. Critter Sketch Challenge: Use Photo Inspiration shown to right. Digital Tuesday: Celebrate the season...any season. My card celebrates Autumn. Digi Doodle Shop's Best: Autumn Colors. It feels like fall today. The temps are in the 40's.